Those of you who have planned a wedding can likely relate…. Following our 180-person Labor Day weekend vegan wedding extravaganza, we were EXHAUSTED. So much so, in fact, that I was hesitant to go anywhere except straight home to my own bed. But Matt convinced me that it would be a good idea to get away for a few days and decompress. The man is rarely right, but I’ll give him credit for this one. It turns out, we <3 Laguna! It is a super romantic, easy-going, vegan-friendly spot where you can truly relax. I would not recommend going to Laguna if you want a bar and club filled party weekend; I would, however, recommend it for a romantic beach getaway. Wearing our super-basic WIFEY and HUBBY t-shirts (ha! ), we took a Lyft from John Wayne airport to our beautiful hotel, The Inn at Laguna Beach. We were feeling relaxed immediately upon stepping foot into the open, nautical-themed, breezy lobby… But when we got to our room, it was heaven. We could hear the waves crashing and smell the salt from our balcony over the ocean, and the room was clean and very zen-like with insanely comfortable beds… I think we slept until 10am every single day. 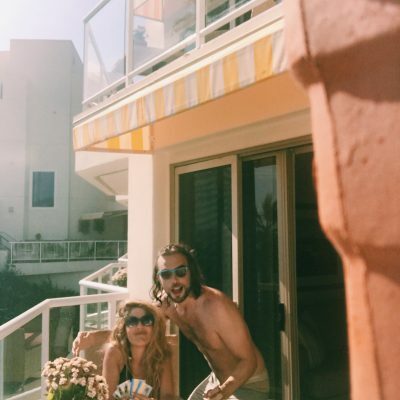 My new husband was obsessed with the basketball court and volleyball court, which was literally a stone’s throw away from us; meanwhile, I was equally obsessed with the beautiful rooftop bar. The Stand. All vegan, long-time establishment (since 1975) with a HUGE… and I mean HUGE… menu. I highly recommend them for delicious smoothies and breakfast… Matt loved their breakfast burritos, and I was totally enamored with their vegan blueberry waffles. All utensils/cups/etc. are compostable and eco-friendly, and the staff knows everything there is to know about the town. Urth Caffe. This has been a Cali favorite of mine for about 10 years (y’all know I used to live in LA, right? ), and since I last visited them they’ve come out with TONS of vegan options! My favorites: The vegan chili and the vegan cheese pizza. I happily overdosed all week long on their almond milk boba green teas… so good. 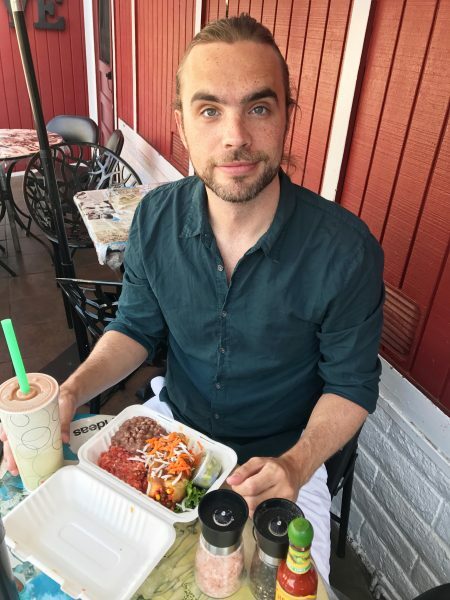 Taco Loco. Y’ALL, I love this funky little outdoor place. Major chill surfer vibes… This is not the spot for a fancy, civilized date! The have a vegan blackened tofu “phish” taco that you can pair with a vegan brownie or cookie of your choice while downing a Corona… Adios, wedding diet! Grab a book and head to the beach! It isn’t a noisy beach, so it’s perfect for napping and reading. Check out the many art galleries along the main street (Coast Hwy)… My favorite one, mostly contemporary, was Las Laguna. Play H-O-R-S-E or beach volleyball! The courts are literally RIGHT outside. Or, if you’re single, just watch the people playing… If you know what I mean. Go on a little pub crawl! Tons of little beachy pubs and dive bars all along Coast Hwy. Go shopping! My favorite one that I couldn’t actually afford was Anastasia; a girl can dream, right? My favorite one I COULD afford was Isla Boutique. There are loads more, though! Thank you guys so much for always being so interested in my little veggie-friendly travel guides! I hope this helps, and I’m sorry it came a little late this month. 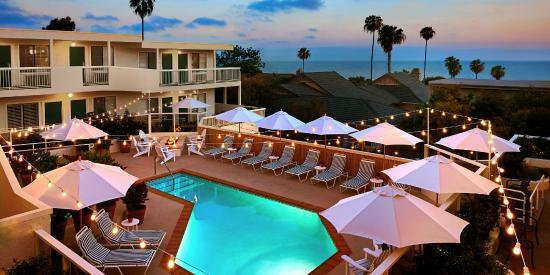 Definitely consider a stay at The Inn at Laguna Beach, as well… You won’t regret it!